When it came time to purchase car seats, safety was absolutely paramount. 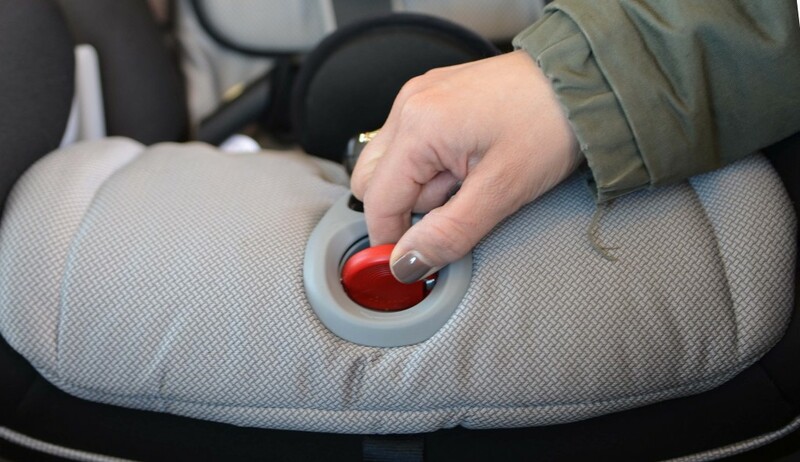 My family ultimately went with Britax because of their outstanding safety standards. 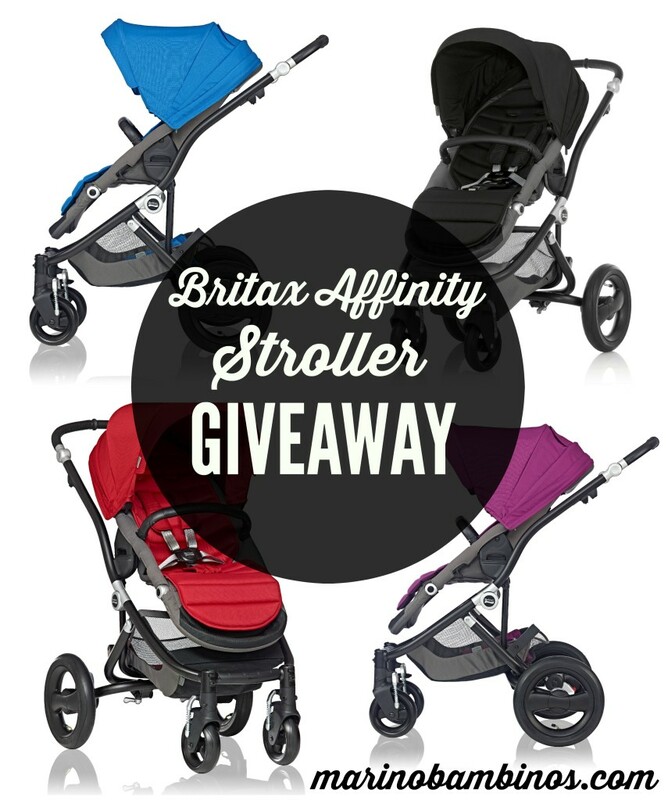 Both of my children have traveled in a Britax Marathon, and my oldest is currently in a Britax Frontier 85. 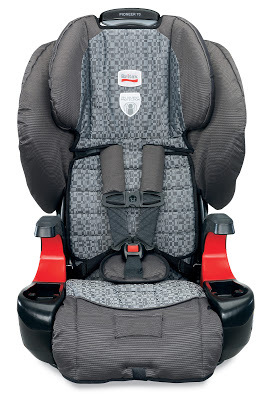 Britax recently introduced the Pioneer 70 Combination Harness-2-Booster seat. 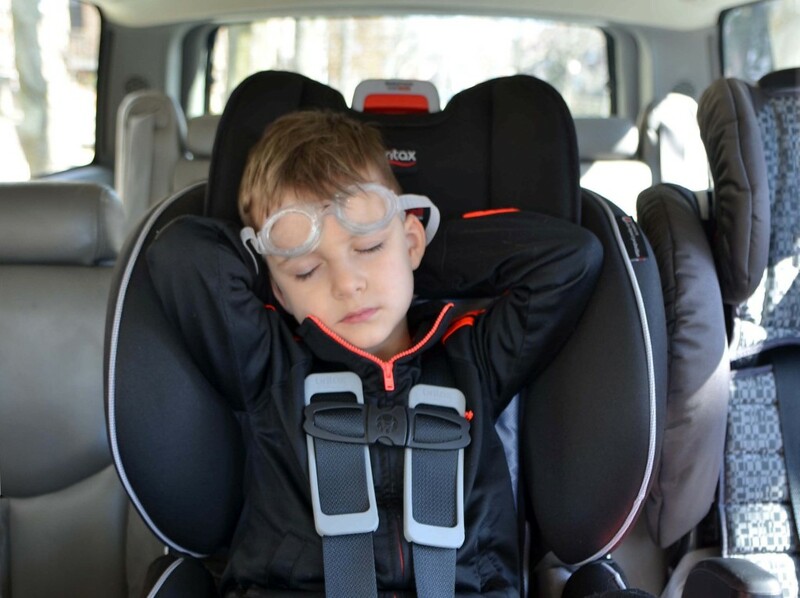 It is designed to grow with the child, accommodating 25-70 lbs (must be two-years-old) in the 5-point harness, and 40-110 lbs as a belt-positioning booster. 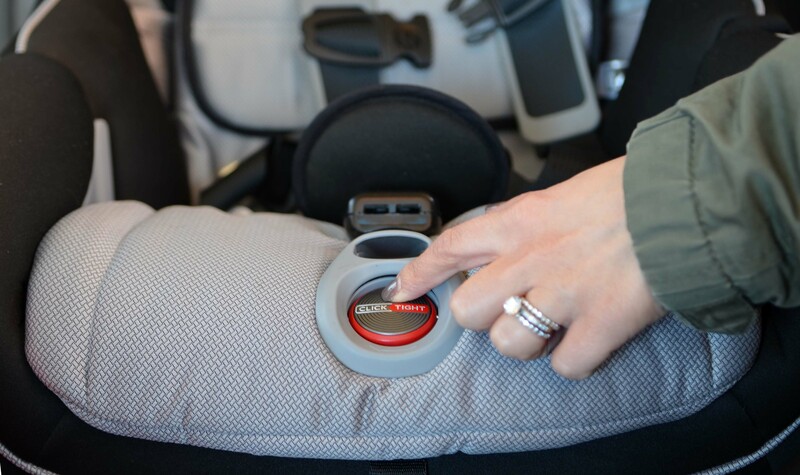 I had the chance to meet with the Britax team to learn more about this premium seat, designed for children graduating from a convertible car seat. Since the Pioneer 70 is a smart-value seat ($229.99 MSRP in comparison to the Frontier 90 – $329.99 MSRP), I asked the product manager if there is any sort of step down in safety features. The Britax team explained in detail how the Pioneer 70 still includes the best safety technologies, at a significantly lower price point. I was impressed when I learned of the seat’s exclusive Safety You Can See technologies. For example, the child’s head is protected by integrated steel bars, base with SafeCell technologies and energy-absorbing versa-tether. True Side Impact Protection provides deep side walls, and a head restraint with energy-absorbing EPS foam to distribute crash forces, shield from vehicle intrusion and contain the head, neck and body. This seat can be reclined from the front, and the headrest and harness can also be accessed from the front. The roomy seat also has cup holders and storage space. In addition, vehicle installment is made simple via an easy-access belt path. Please note that the Pioneer 70 is not yet FAA approved for airline travel – however I can’t image navigating an airport with a car seat this size! When I first viewed the Pioneer 70, I was a bit confused with the belt path design. The lower back portion of the seat appears to stick out a tiny bit (the belt path is behind it). I was certain that my son would notice this despite the fact that the product manager explained that it was not an issue in their extensive product testing (there is also an ample amount of material-encased padding over the belt path). 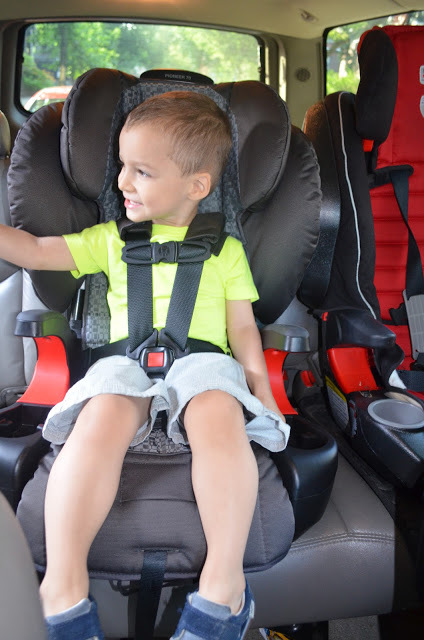 I had my son travel in the seat for a few weeks prior to writing this review since I wanted to wait for the novelty of a new seat with cup holders/storage areas to wear off. Much to my surprise he never once mentioned a sensation is his lower back. The belt path design continues to be a non-issue for my son. 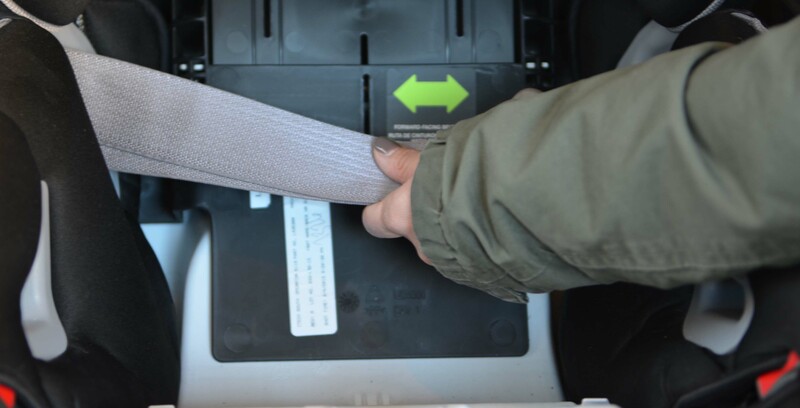 The Britax Pioneer 70 Combination Harness-2-Booster will be on store shelves next month, and our experience has been positive. My son is clearly comfortable in his spacious new seat (he especially loves the arm rests and storage space). The directions are straightforward, and installation was easy (I like the open-access belt path). Most importantly, I know that my son is traveling in superior safety. I’m also pleased with the fact that the Pioneer 70 is designed to accommodate him as he grows older. 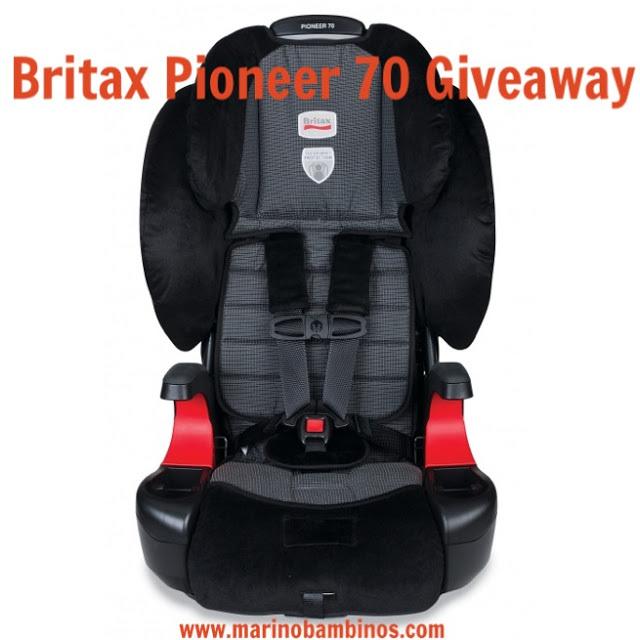 Britax is generously giving away one Pioneer 70 Combination Harness-2-Booster seat to one lucky winner! The winner can even select their color (I’m a fan of Onyx and Silvercloud. It also comes in Kiwi, Redwood and Gardengate). Enter via the below rafflecopter. A winner will be selected in one week. Please note that all entries are verified and the contest is open to US only. Thanks for visiting and good luck! 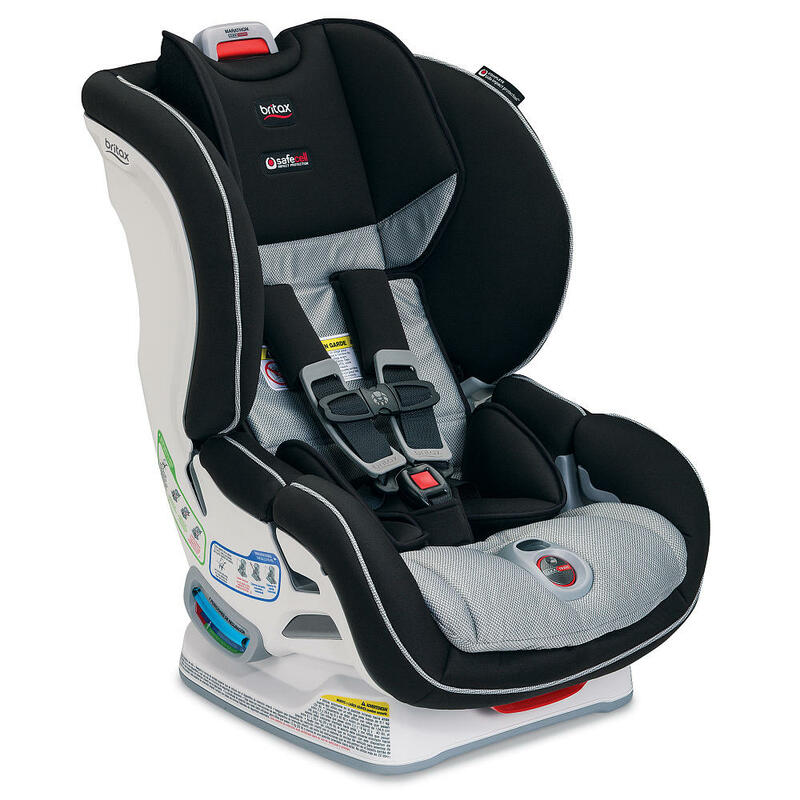 Britax provided me with a Pioneer 70 Combination Harness-2-Booster seat for review purposes. All opinions expressed in this post are my own.